Cold weather is arrived and I get caught unprepared. 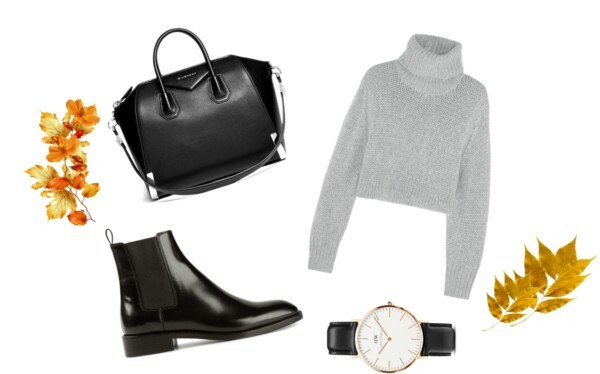 I am craving for some warm sweater and the aw '14/'15 trends suggest me to pick a turtle-neck sweater. Honestly high-neck gives me a sense of suffocation and I am allergic to wool (it itches) so I am gonna go for a cotton or a mohair sweater with a wide high-neck. Now I just need to find it (any suggestion is welcome). Then I met these beautiful boots online and I am looking for a cheaper version. I find them a perfect choice when I want to stay comfy and leave my chelsea low-heels boots at home. If you don't live under a rock, you will probably have seen or heard about Daniel Wellington's watches: they are really simple and classy so I can say that they have an eternal look (Oh the straps are interchangeable so you can always match your outfit or your mood). A new bag is always welcome and I need a big one to carry all my book to school but none seem to be huge enough for this task, any idea? What are your essential during fall time? This entry was posted on Wednesday, 5 November 2014 and is filed under fashion,idea. You can follow any responses to this entry through the RSS 2.0. You can leave a response.